Cropper free alternative to Snagit. If you read my posts, you know that my writing skills can be improved by a lot. Therefore, I tried to put a lot of pictures in my posts to compensate my English. Until recently I was using Snagit application from TechSmith to capture my screens snapshots. Snagit is a very good application and I wish I still had it today. However, I had 128 days inactivity of posting. During this time I upgraded my computer to Windows 7. couldn’t find my old license of Snagit to install it on new system. Even Snagit is not that expensive, just $49.95, I looked for free alternative. I found it on CodePlex, it’s Cropper by Brian Scott. 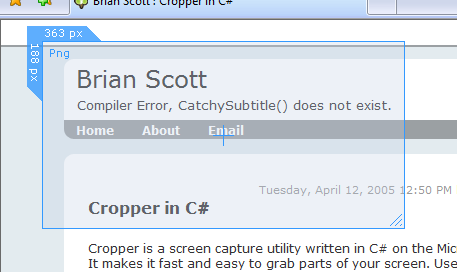 Cropper is not as powerful as Snagit but it allows me very fast to get a screen capture an paste it to my post. You also can find a collection of plugins for Cropper on CodePlex. One feature I miss from Cropper is an ability to annotate the image I just captured. May be I should stop wishing and get my hands dirty and contribute to Cropper or Cropper Plugins open source projects.